You need to capture tons of traffic that wants to buy something. If you take this approach, you’d practically have to hijack your own order links (or affiliate links) not to make a sizable income. These two factors – demand and buying traffic – are what separate the “wannabe” marketers from the millionaires. Because there’s no real secret – you just need to sell what thousands of people are already buying. 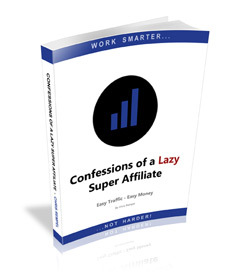 Chris Rempel, author of “Confessions of a Lazy Super-Affiliate”, reveals 5 of his most effective traffic strategies and niche-targeting tactics in full detail. You can get it by clicking here.